Is Club MAC Alcudia good for teenagers? At Club MAC, we are constantly working to make sure that you and your family enjoy every minute of your stay with us. We have carefully planned activity programmes for the youngest to the oldest, and of course this includes teenagers. We know it can be worrying that your teens may not find enough to do or might get bored during their family holiday. That’s why Club MAC has ensured there is plenty for them to do, including access to superfast WiFi! During the busiest part of the season, we have a special programme of activities for teenagers. We’re just into the last couple of weeks for this year as the teen programme runs in July and August only. However, if you’re coming in September or October, don’t worry, there is still lots of fun to be had. Beach excursions: a whole morning out with organised sports, games and activities. Includes a picnic. Entertainer for a Day: this is where your teen can find out whether they’d enjoy being a Club MAC entertainer! They get to do everything our fabulous team does for one day. Disco: once a week teen-only disco, complete with alcohol free drinks and all the tunes they could want. 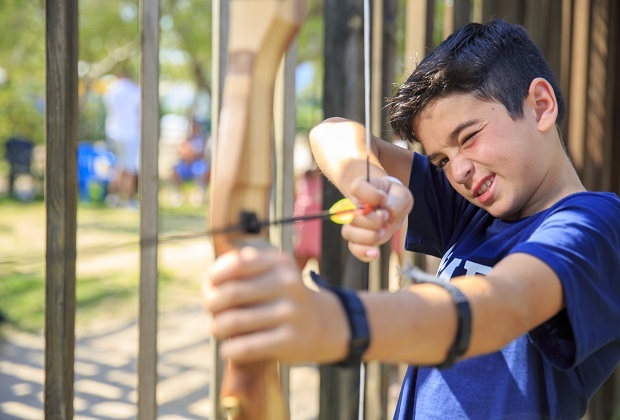 Sports: there’s also archery, waterbasket, football, waterpolo and carabine shooting to choose from. There’s so much on offer for families that it will be difficult for your teenager to get bored even if you visit outside of high season. They can join in any of the many sports that are on offer, from volleyball and archery to table tennis and football. As our site is big and we have three separate hotels (Marte, Jupiter and Saturno), your teens are bound to find friends very easily. We have plenty of swimming pools for them to try, and they’re welcome to all of the general entertainment activities laid on throughout the season. While you’re staying with us at Club MAC, we recommend you visit the beach at least once. Although we have plenty of swimming pools, facilities and entertainments on site, and the hydropark just across the road, sometimes you can’t beat lazing on the sand and having a swim in the calm, warm waters at Alcudia. We have miles of golden sand under 1km away, and your teenagers will find plenty to do. Choose from various watersports, boat trips and other adventures for the perfect family day out, or stick to the sun, sea and sand of the spacious beach. If you are coming after September, you’ll find it’s less crowded than in the height of the school holidays, and there is more than enough space for everyone in your family to enjoy themselves. We know that teenagers must be connected at all times, and during their holiday especially so! We have free WiFi on the ground floor of all the hotels, and if you’re booked into a Premium room you’ll have a high-speed connection included in the price. If you’re in a Standard room, you can pay for WiFi access at a reasonable cost, and make sure that everyone in your family is catered for. The WiFi allows streaming of films and entertainment and is fast enough for video games too.